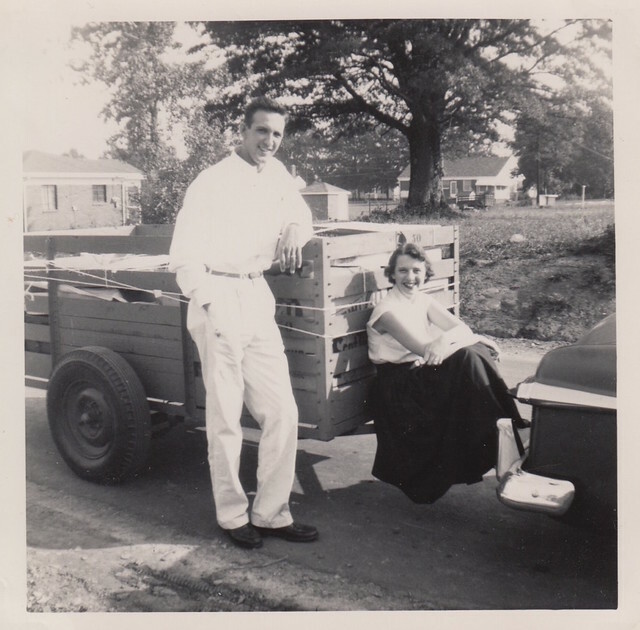 My grandparents, heading to their first home together (in Spartanburg, SC), September 1953. I’m working on a project about my maternal grandparents’ love story right now, which basically means I’ve been spending a lot of time hunched over a scanner, weeping. This photo, in particular, just wrecks me. I can’t look at it for too long or I will summarily lose it. He is so handsome and casual, and she is so adorably plucky, perched there on the hitch between that proto-U-Haul and their car. Why does old age have to be so cruel? I am absolutely crushed by the unfairness of it all. I think about them, and my parents, night and day, without relief. In lighter news, we are constantly grateful for what marvelous friends we have and how much they love and support us and make us laugh and inspire us. This is the main reason we have no plans for leaving Charlottesville. and yes… old age can be a little cruel sometimes. Have a Prosperous day and God bless! Sorry.. I forgot to leave me site: come by sometimes..
What a truly beautiful endeavour, to be working on ‘love stories’ within our families. It take so much courage to do this. Old age is so brutal, hopefully we can muster all the grace we have within ourselves to do it in the best way ‘we can’. Good luck. Thanks so much; appreciate your kind words. What a wonderful photograph! I remember when they got married. I was a flower girl, and sweet Lucy invited me to her bridesmaids luncheon, where I felt so grown up and special. Always, they have been for me the ideal couple. I think that your project will help with the grief and anguish you are feeling now. I have followed your posts on racism with empathy and interest. My friend Mab Segrest, who lives in NYC, is affiliated with an organization of white people who are working to promote racial justice. It is called Stand Up for Racial Justice (SURJ). You might google them if you are interested. Hang in there. Catharsis will surely come.